If you happen to walk past Num Pang Kitchen on 38th Street near Broadway and dip in, you would be forgiven an eye roll. On one wall is a sign of a delicious-seeming sandwich with the words “Real Recognize Real,” and on the opposite wall is a giant graffiti mural celebrating “Times Square South,” which is what real New Yorkers have never, in five centuries, called 38th and Broadway. Let that transgression slide, however, because Num Pang Kitchen has brought hope to 2017. It has brought light to darkness. 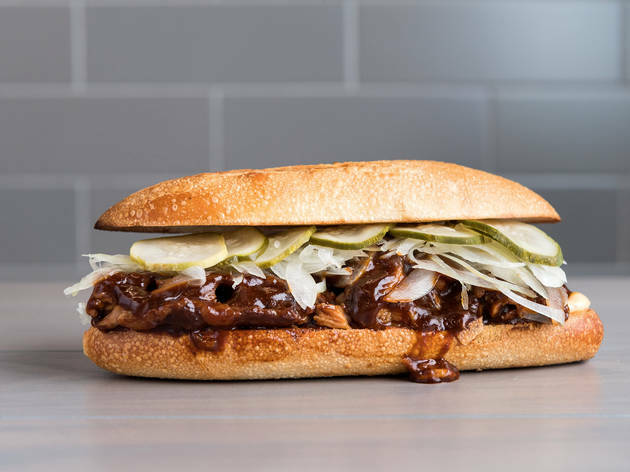 It has brought a gourmet take on the McRib to Times Square. 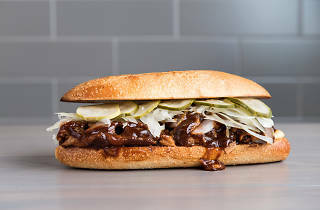 “I can't really mention the sandwich you might be thinking of,” said Daitz when he served some NcRibs to me and another helper (one who had never eaten a McRib). "But what I can say is that if this makes you think of another sandwich, ours is better." The sandwich is here until December 19, when it will presumably become available exclusively at the North Pole to power the miracle of Christmas—such is its power. Ironically, the NcRib’s delight is in its inconsistency. You don't get bored of eating it. Some of the meat is crisp, some is pulled, some is plump, some is fatty, some is supple. All of it is a monument to what meat can be. The NcRib is Margot Robbie to the McRib's Tonya Harding, the Superman to its Clark Kent. The NcRib is flat out the Ryan Gosling or Meryl Streep of McRibs. It can do no wrong. In the words of Ender De La Rosa, a 29-year-old doorman from Jackson Heights who happened to be enjoying his own NcRib as we tasted ours: “Step aside, McRib. This is a real sandwich. You can taste the quality.” Hours later, he too had a craving for another NcRib. This next part is just for one Time Out reader in particular, who we'll call Mayor McBlasio to protect his identity: Please give the NcRib a key to the city. It already owns the key to our hearts.